After you’ve selected WhatsApp during booking or checkin, you’ll be asked for your telephone number. This wil be verified online (immediately) whether it is a registered WhatsApp account and KLM Royal Dutch Airlines appear as a contact in your friends lists. The telephone number ‘+31 20 649 0787’ is just a verified ‘id’ with WhatsApp. You cannot call the number. If you try to call them through WhatsApp it says: ‘Call Failed’. If you try to call them through regular mobile phone, you get a voice mail message saying that you should a text message. When you simple add the number to your contacts without booking a ticket, you’ll see the name details you’ve entered (I entered KLM WhatsApp). When you just send a text message after adding a contact, I’ve tried, and response after 30 minutes (no blue, just two green’ checks’), a manual response, thus no chatbot (yet) on the other side. The next step according to me from an outsider point of view, that a chatbot will be integrated and your voice will be interpreted and the dialogue starts. The company is quite active integrating (chat)bots in social media channels. Earlier they introduced BB Bot, their Facebook Messenger (chat)bot and they also integrated a payment system through WeChat. KLM is on an - how applicable - exciting journey! KLM now offers you flight information via a verified KLM WhatsApp account. After booking your flight on KLM.com, you can choose to receive your booking confirmation, check-in notification, boarding pass, and flight status updates via WhatsApp. This makes information easy to find in a single place, so it is available at the airport, en route or at home. Opted in? Ask us questions as well! Any questions? No problem. 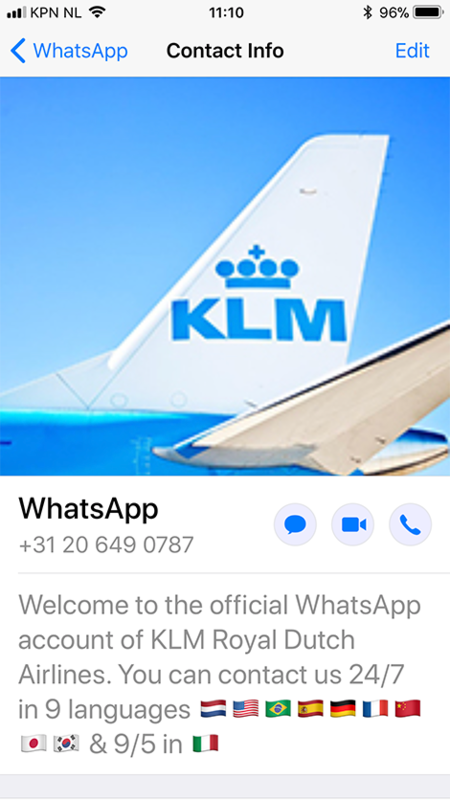 If you opted in on KLM.com to receive flight information and documentation via WhatsApp, you will also be able to contact us, 24/7 in the same thread. We answer questions in Dutch, English, German, Spanish, Portuguese, French, Japanese, simplified Chinese and Korean. You can also contact us in Italian during local office hours. All messages on WhatsApp are end-to-end encrypted. 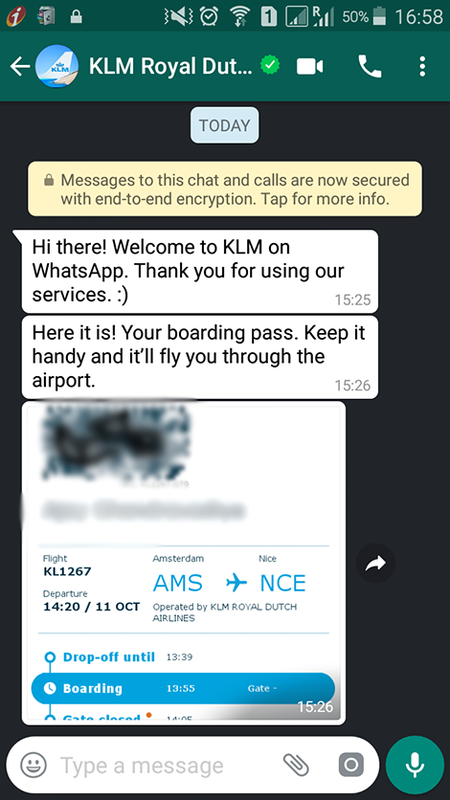 WhatsApp has created a business application that makes it possible for KLM to connect to you, using the same end-to-end encryption as used in WhatsApp. Messages are secured so that only you and KLM can read them, and nobody in between, not even WhatsApp. You get on board by opting-in on KLM.com during your booking or check in flow. If you wish to make use of KLM’s WhatsApp service, the only thing you’ll have to do is check the box and fill in your WhatsApp phone number. Your country code has been pre-filled for you, but you can change it if needed. The system checks immediately whether your phone number is registered as WhatsApp account. If so, a check mark appears.